The Kandu (or Halwai) people are traditionally a business community that dry roasts grain for the other people groups. Through the years they spread out all over South Asia including Bangladesh. 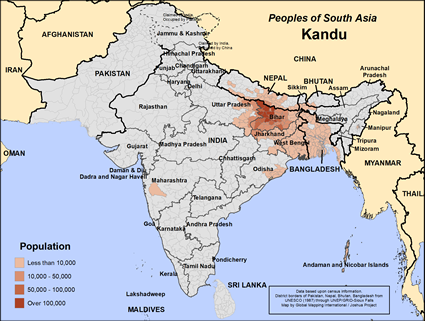 The majority of the Kandu people are in India, but some also live either in Nepal or Bangladesh. Modern Kandu people have left their old profession of parching grain and now work as merchants, moneylenders, shopkeepers, and dealers in grain and spices. They are strictly vegetarian and they do not consume alcoholic drinks. A regional council, known as the Vaisya Abha, looks after the welfare of their communities. The Kandu people tend to live in extended families. They marry primarily within their own clans although they do not forbid marriage outside their group. Almost all of the Kandu people are Hindu, even in Muslim Bangladesh. Hindus worship many deities, but their practices are diverse. In general, Hindus are pragmatic in their spiritual beliefs, offering worship to gods in exchange for benefits rather than out of love or devotion. The Kandu people revere the written Hindu Vedas and the Upanishads. They celebrate traditional Hindu holy days along with other Hindu people groups. Pray for those in this community who will someday come to Christ as savior. Pray they will be devoted to one another in brotherly love, honoring one another above themselves. * Pray the Holy Spirit would create a spiritual hunger for the Bible and spiritual literature among the Kandu people in Bangladesh. * Pray for the Lord to thrust out workers to the Kandu people in Bangladesh. * Pray for the gospel to penetrate Kandu families so that they will be studying God's word and sharing it with others. http://www.globalprayerdigest.org/issue/day/2017/10/18View Kandu in all countries.